Hardinge DSM-59R PLC Automatic Second OP Lathe s/n DV-59-19631 w/ Omron PLC Controls, Automatic Cycles, Pneumatic Gang Tool Cross Slide, (2) Over-Spindle Pneumatic Cross Slides, Northfield 4” 3-Jaw Pneumatic Chuck, Coolant. Hardinge DSM-59R PLC Automatic Second OP Lathe s/n DV-59-19049 w/ Omron PLC Controls, Automatic Cycles, Pneumatic Gang Tool Cross Slide, (2) Over-Spindle Pneumatic Cross Slides, Northfield 4” 3-Jaw Pneumatic Chuck, Coolant. Hardinge HSL PLC Automatic Speed Lathe w/ Omron PLC Controls, Automatic Cycles, Pneumatic Gang Tool Cross Slide, Over-Spindle Pneumatic Cross Slide, No.21 Colleted Spindle. Hardinge HSL Automatic Speed Lathe w/ Analog Controls, Automatic Cycles, Pneumatic Gang Tool Cross Slide, Northfield 4” 3-Jaw Pneumatic Chuck. Hardinge HSL PLC Automatic Speed Lathe w/ Omron PLC Controls, Dial Controlled RPM, Automatic Cycles, No.21 Colleted Spindle (In Process of Being Rebuilt). Elgin PLC Automatic Second OP Lathe w/ Omron PLC Controls, Automatic Cycles, Pneumatic Gang Tool Cross Slide, Northfield 4” 3-Jaw Pneumatic Chuck. Traub A60 2 3/8” Cap Automatic Screw Machine s/n A60/2890 w/ 240-2920 RPM, Drill Station, (4) Cross Slides, Bar Feed, Coolant. Traub / Alexander A42 1 5/8” Cap Automatic Screw Machine s/n A42-1824 w/ Drill Station, (4) Cross Slides, Work Stop, Bar Feed, Coolant. Traub A25 1” Cap Automatic Screw Machine s/n A25/8484 w/ 550-4000 RPM, No.21 Colleted Spindle, Drill Station, (4) Cross Slides, Bar Stop, Pneumatic Bar Feed, Coolant. Traub A25 1” Cap Automatic Screw Machine s/n A25/4852 w/ 500- 2800 RPM, No.21 Colleted Spindle, Drill Station, (4) Cross Slides, Bar Stop, Coolant. (2) Alexander LA25T 1” Cap Automatic Turret Lathes s/n’s A7725, A76133 w/ 4-Station Automatic Turret, (4) Cross Slides, No. 21 Colleted Spindle, Bar Feed, Coolant. Traub A45 5/8” Cap Automatic Screw Machine s/n A45/10506 w/900-2800 RPM, Drill Station, (4) Cross Slides, Work Stop, Pneumatic Bar Feed, No. 10 Colleted Spindle. Super Tec Type STC-12 Centerless Grinder s/n 4356 w/ Tapered Head, 5 ½” Wide Grind and Feed Wheels, Hydraulic Wheel Dressers, Coolant. Kent KGS-306AHD 12” x 24” Automatic Hydraulic Surface Grinder s/n 880454-2 w/ Kent Automatic Controls, Electromagnetic Chuck, Coolant. Royal Oak “R-O Grinder” Tool and Cutter Grinder s/n 520-G w/ Compound Grinding Head, Motorized 5C Work Head. Boyar Schultz mdl. 612 6” x 12” Surface Grinder s/n 5544 w/ Walker 6” x 12” Magnetic Chuck. Accu-Finish Series II Carbide Tool Grinder. Continental and Jet Bench Grinders. Hardinge HLV Wide Bed Tool Room Lathe w/ 125-3000 RPM, Inch Threading, Tailstock, Power Feeds, Tool Post, 5C Collet Closer, 6” 4-Jaw Chuck, 5” 3-Jaw Chuck, Coolant. Victor 1640 16” x 40” Geared Head Gap Bed Lathe s/n 460724 w/ 65-1800 RPM, Inch/mm Threading, Tailstock, Steady Rest, Mack Tool Post, 10” 3-Jaw Chuck, 5 ½” 3-Jaw Pneumatic Chuck, 16” Faceplate. Hardinge DSM-59R Second OP Lathe s/n DV-59-19611 w/ 6-Station Turret, Automatic Pneumatic Cross Slide Assembly, No.21 Colleted Spindle, Coolant. Hardinge VBS Second OP Lathe s/n DV-59-16917 w/ 6-Station Turret, Automatic Pneumatic Cross Slide Assembly, No.21 Colleted Spindle, Coolant. Hardinge VBS Second OP Lathe s/n DV-59-15745 w/ 230-3500 RPM, 6-Station Turret, No.21 Colleted Spindle, Coolant. Feeler / Ramco Second OP Lathe s/n 90514 w/ 230-3500 RPM, Cross Slide, 5C Collet Closer. Lagun Vertical Mill s/n 14296 w/ Anilam Spirit DRO, 3Hp Motor, 58-4200 Dial Change RPM, R8 Spindle, 9” x 42” Table, 6” x 8” Pneumatic Cross Slide Table. 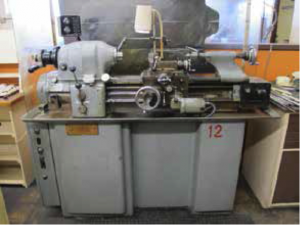 Bridgeport Vertical Mill s/n 119278 w/ 1.5Hp Motor, 60-4200 Dial Change RPM, Chrome Ways, 9” x 42” Table. Bridgeport Vertical Mill s/n 151519 w/ 1.5Hp Motor, 60-4200 Dial Change RPM, 9” x 42” Table. Brown & Sharpe Automatic Horizontal Mill w/ 105-2340 RPM, 8” x 26” Table. Linley Deep Hole Mill/Drill Machine w/ 10,000 RPM, 7” x 18” Table. Brother “Hi-Pace” mdl. AF1-112 Automatic Drilling Machine w/ 650-6000 RPM, Peck Mode, 5C Indexing Head, Table. (3) Kira mdl. KTV-1 Geared Head Tapping Machines s/n’s 451916, 451911, 451719 w/ 9” x 9” Table, Gear Sets. Custom 4-Station Cross-Drilling Machine w/ 10,000 RPM Drilling Heads, Heavy Duty Steel Table. (4) Continental and LS Bench Model Drill Presses. Benchmaster mdl. 152 Bench Model OBI Stamping Press (Rebuilt) w/ 6” x 10” Bolster Area. Custom 2800 Lb Cap Pneumatic Arbor Press. 5-Ton OBI Stamping Press (Needs Work). Kalamazoo mdl. 7AW 7” Horizontal Band Saw s/n K13027 w/ Manual Clamping, Work Stop, Coolant. 2015 U.S. General 5Hp Vertical Air Compressor w/ 60 Gallon Tank. Kellog-American Hydrovane mdl. 55CK 15Hp Rotary Vane Air Compressor (Needs Rebuilding). (3) Kurt 6” Angle-Lock Vises w/ Swivel Bases. (2) Kurt 5” Angle-Lock Vises. (5) Northfield 4” 2-Jaw and 3-Jaw Pneumatic Chucks. (2) Yuasa 5C Indexing Heads. Mitutoyo 12” Dial Height Gages. (3) Mitutoyo 0-1” Indicating OD Mics. Mitutoyo OD Mics to 6”. Mitutoyo 0-1” Thread Pitch Mic. Mitutoyo “HiCator” Dial Drop Indicators and Stands. Deltronic Gage Pins and Pin Gage Sets to 1”. Standridge 24” x 36” x 4” Granite Surface Plate w/ Roller Stand.